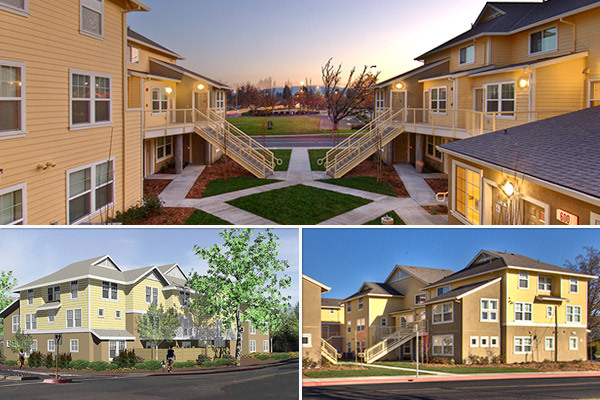 TFA designed this three story 32-unit affordable apartment project for the Rural Communities Housing Development Corporation. Located on a 0.87 acre site with parking at the perimeter, this 30,600 square foot project has 1,2 and 3 bedroom units in three buildings clustered around a south facing central courtyard. The community and laundry rooms are situated to provide visual contact between those rooms and the courtyard and tot lot, where young children could play while parents socialize. The combination of both gable and Dutch gable roof forms, as well as exterior plaster and horizontal board siding placed at varying levels have been used to reduce the apparent building scale. The project will incorporate energy efficient appliances, “green” materials such as low VOC paints and will exceed California Title 24 energy standards. Project financing includes HOME funds through HCD.